In many respects, the daiquiri is a humble drink. Its ingredients are few and not difficult to acquire. Making one doesn’t require any extraordinary skill or technique. And yet the daiquiri enjoys a certain exalted status in the pantheon of cocktails – particularly among those who make them for a living. I remember seeing a segment on a local news show last year in which John Gertsen, the now former general manager of Drink and one of the country’s most respected bartenders, named the daiquiri one of his three favorite cocktails. The daiquiri is the pre-shift drink of choice at New York’s renowned cocktail bar Death & Co, and their recently published cocktail book devotes six pages to variations of the recipe – including a two-page spread that covers each bartender’s preferred ingredients. The daiquiri has enjoyed something of a revival after years spent out of the limelight (no pun intended). For years I think there was a tendency to dismiss it as little more than a poolside drink. And really, as cocktails go, how seriously can you take those slushy, artificially sweet concoctions you see endlessly churning in a machine at a beach bar? Not that I’m above a frozen libation on a summer afternoon. 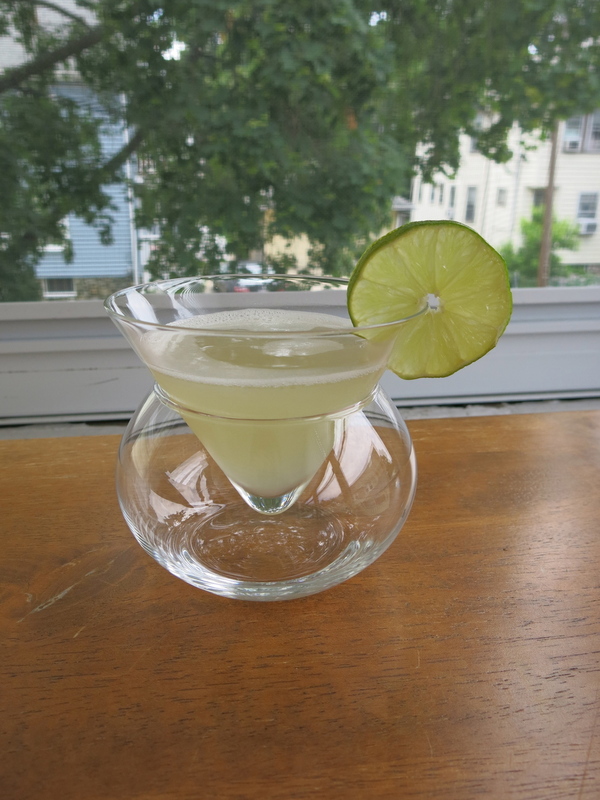 But whenever I see a pre-made daiquiri, it makes me wonder – since it’s so easy to make the real thing, why wouldn’t you? Which brings us to the purpose of this week’s post. A few weeks ago, the good people at Brugal were kind enough to send me a sample bottle of their Extra Dry rum. It’s a product I’ve long been familiar with; anecdotally, I’d say it trails only Privateer in terms of popularity among Boston-area mixologists. But the Brugal family has been making rum in the Dominican Republic since 1888, and a series of aggressive marketing campaigns in recent years have raised the brand’s profile in the United States. Last year I got to learn about the distillery and its rum line when I attended a Brugal Rum Redefined event in Boston. But having a bottle to myself gave me the opportunity to get better acquainted with the spirit – and to try it out in a homemade daiquiri. First, a bit about the Brugal Extra Dry product. It’s a fairly unusual rum, given that dryness isn’t a quality one ordinarily associates with a spirit made from molasses. Brugal distills most of the heavy alcohols and flavors out of its rum, leaving a spirit that’s crisp, clean, and smooth. And its clear complexion can be deceiving – Brugal Extra Dry is an aged rum that spends 2 to 5 years in white American oak casks before a triple-filtering process strips it of color. The result is a rum that’s more subtle than sweet. On the nose, there’s no alcoholic burn; just the subdued but unmistakable aroma of rum. Sipping it reveals notes of citrus and vanilla up front and a faint sweetness on the back of the palate. Not only does it make the best daiquiri, in my opinion, the measurements are pretty easy to remember. The instructions are simple. 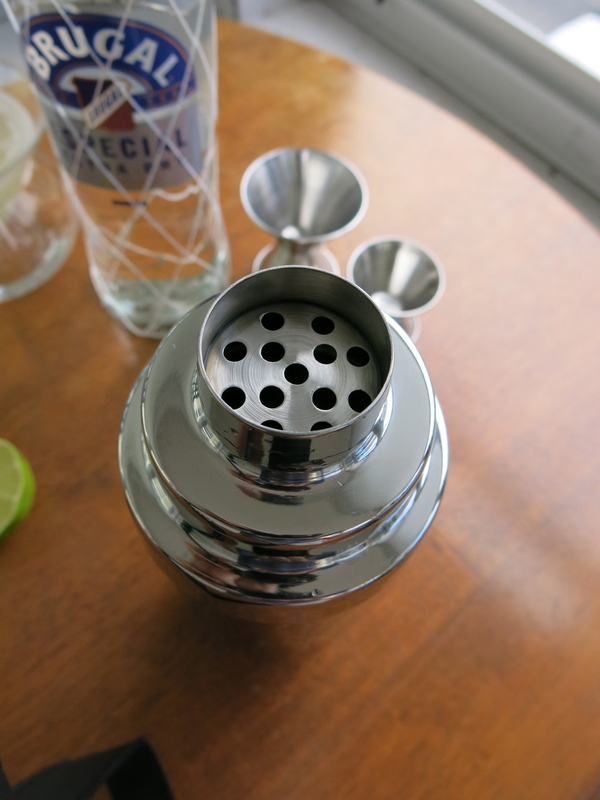 Throw a few ice cubes in a cocktail shaker. I prefer the cobbler shaker for a daiquiri. The wider holes allow little flakes of crushed ice to find their way into the drink, and I like the extra texture and bracing quality. Add the rum, then the juice, and finally the syrup. Shake it for a good 15 seconds or so, then strain it into a chilled glass. If you want to impress your guests (or your Instagram followers), garnish it with a lime wheel. And there you have it. Of course, a daiquiri is only as good as the ingredients you use, and it should come as no surprise that Brugal works beautifully in this timeless cocktail. With its mellow character and citrusy notes, the rum allows the lime juice to shine, giving the drink a fresh, natural flavor. And because of the spirit’s dryness, the simple syrup doesn’t over-sweeten the drink. The result is a wonderfully smooth, well-balanced daiquiri that truly exceeds the sum of its parts. 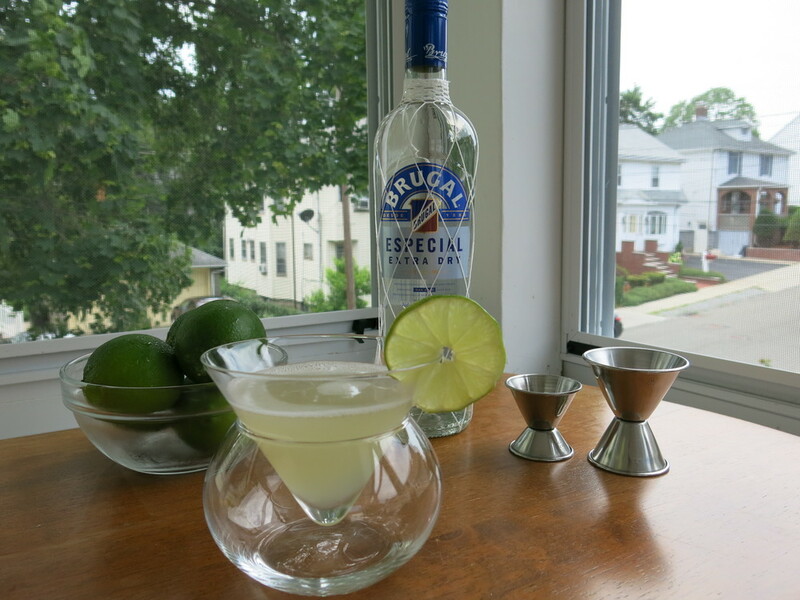 To get an even better understanding of Brugal, I thought it would be useful to make another daiquiri with a different rum. The obvious choice would have been Bacardi, one of the world’s best-selling brands and one that bears all the hallmarks of a mass-produced spirit. 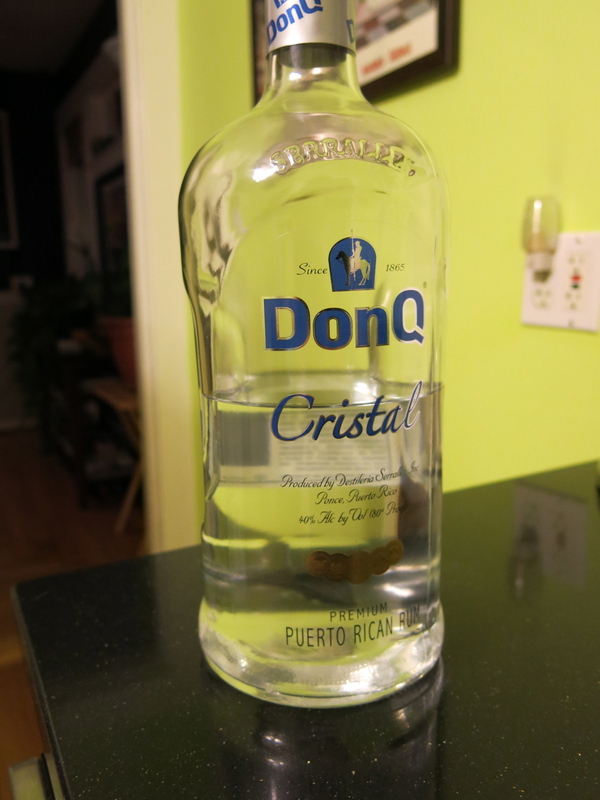 But I didn’t have any Bacardi on hand, so I used another old standby – Don Q. A solid, respectable rum made in Puerto Rico, I’ve enjoyed Don Q in many a cocktail and will continue to. But under scrutiny, the differences between Brugal and Don Q quickly become apparent. On its own, Don Q has more of that boozy burn when you sniff it. Sipping it neat isn’t bad, but with some prominent spices and heavier flavors, it’s more aggressive than the Brugal. Those traits carry over to the Don Q daiquiri. It’s certainly enjoyable, but lacks the clean, refined essence of its Brugal counterpart. This version has a bigger, more noticeable mouth feel and a bolder alcohol flavor. Highly enjoyable, but not exceptional. And yet with two freshly made daiquiris in front of me, I was reminded of my very first daiquiri experience. It was of the frozen strawberry variety, made with a sugary mix that came out of a can. Given what I assume my age was at the time, I’m sure I thought it was the best thing ever. But my appreciation for this classic, straightforward cocktail has grown considerably since then, and my idea of what constitutes a quality rum has been redefined. Note: The bottle of Brugal rum I received was complimentary. I was under no obligation to review or promote it in any way, shape, or form.